in Springdale and Zion National Park. Springdale locals are blessed with the compliments of their backyard daily. Which isn’t surprising, considering that they’re backyard is only one of the most famous and stunning National Parks ever! Springdale is known as “The Gateway To Zion”, due to the fact that Zion National park is a mere 1.1 mile, 4 minute drive away. 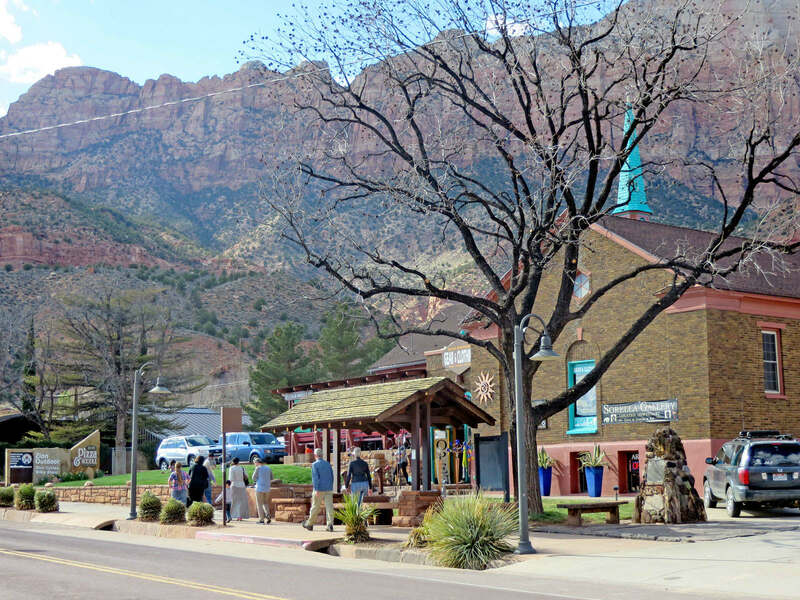 Many visitors to Zion start in Springdale and take the free shuttle to the park and make short stops to explore the small town and shop along the way before or after hiking. Springdale has become a huge tourist destination and hangout for outsiders who are there for Zion’s extreme adventures. It’s easy to see why.. This spunky, colorful and fun little town is filled with fun shopping centers, restaurants, bars/pubs and so much more. There always seems to be something going on whether it be a small town event, concert or something else, there really is always something going on. Trips to Zion for us St. George Locals don’t seem complete without a pit stop in Springdale. Love the vibes and people there. If you have heard of Springdale or have been there, then you have most likely heard of it referred to as “The Gateway To Zion”. This little spunky town is located just 1.1 miles from Zion National Park and is incredibly hard to miss! With its majestic views of Zion and its fun and inviting atmosphere, Springdale is definitely a place that anyone can find enjoyment in visiting! As you pull in you will see quaint, adorable little shops all along each side of the road with mounds of rocks for sale stacked on tabes outside. Each shop is unique and colorful and full of the most lively and energetic employees. The charisma of this town and the people here will keep you returning again and again. There is nothing more fun and relaxing than a quick weekend trip from St. George to Springdale to enjoy shopping, entertainment, nightlife and lodging unlike any other. This town is known very well for the dining options. Bit N’ Spur, Oscars, Flying Monkey and more! The food is unbeatable here, perfect for a special date night or just to experience something far from regular. There is surely something here to satisfy even the pickiest eaters. Springdale is also known for its involvement in the Arts community. Local artists works are showcased at nearly all the shops and restaurants and Local musicians can be found rocking the stages at places like The Bit N’ Spur and more. Which brings us to the nightlife! What a place to party! Who would have thought such a small little town could produce such an amazing and fun nightlife? Due to it’s location to Zion, Springdale offers amazing and energetic diversity of people. There are people from all over the world lodging here and that makes for one interesting night at the pub! Springdale is a one of a kind town with that one of a kind feel, something that needs to be experienced.